According to a widespread popular belief the Jews were forced out of Palestine after the conquest of Jerusalem and the destruction of the Temple by Titus, son of Emperor Vespasian, during the First Jewish Revolt (67-73 AD). As a matter of fact before the Revolt many large Jewish communities existed outside Palestine already. The journeys of St. Paul the Apostle (Saul of Tarsus) in the 40s and 50s indicate the presence of Jewish communities in Syria, Cyprus, Turkey and Greece at Damascus, Salamis, Antioch, Seleucia, Philippi and Veria to name just locations covered in this website. After the Second Jewish Revolt (132-35) Emperor Hadrian banished the Jews from Jerusalem and almost all the inhabitants of Judea (by this meaning the region south of Jerusalem) were massacred or made slaves and deported. In the rest of Palestine however, and especially in Galilee, large Jewish communities are recorded until the Arab invasion in the VIIth century. 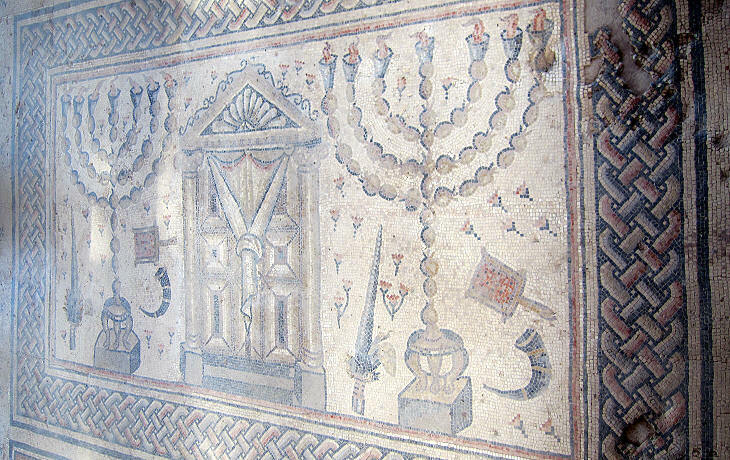 Although relations with the Hellenised (and later on Christian) population were tense, the Jews were wealthy enough to build and decorate synagogues of some size. 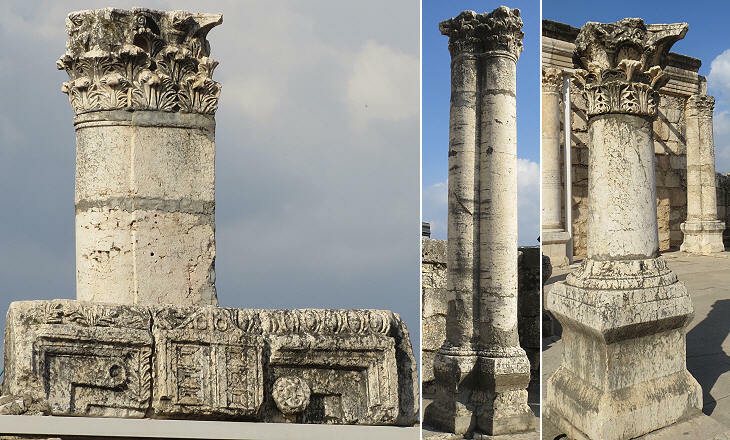 Overall, while retaining their religious identity, they adopted the construction techniques and design patterns which were common throughout the Roman Empire. The two Jewish Revolts were to some extent civil wars, because a section of the Jewish population, by and large the wealthiest one, stood with the Romans (e.g. the town of Sepphoris). 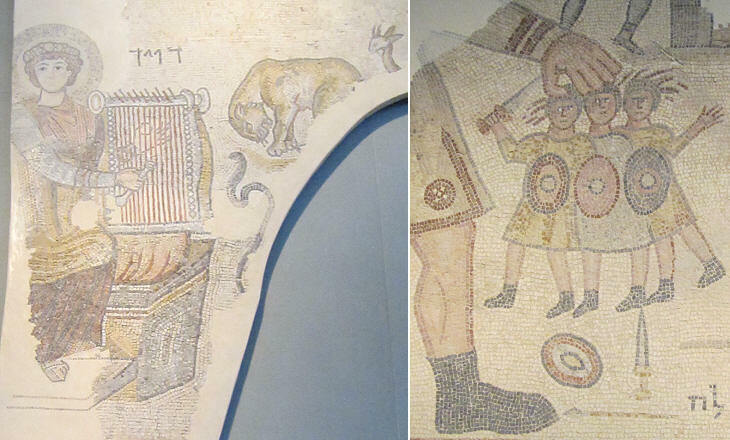 After the Zealots, the uncompromising followers of the tradition, were defeated, the Jewish communities did not hesitate to embellish their synagogues with mosaics portraying Jewish heroes, notwithstanding the assumed prohibition to portray human beings or animals contained in the Second Commandment. The Museum of Israel houses a number of synagogue lintels and mosaics which were removed from their original locations to ensure their conservation, but a number of synagogues have been left in situ and have been included in small archaeological areas. 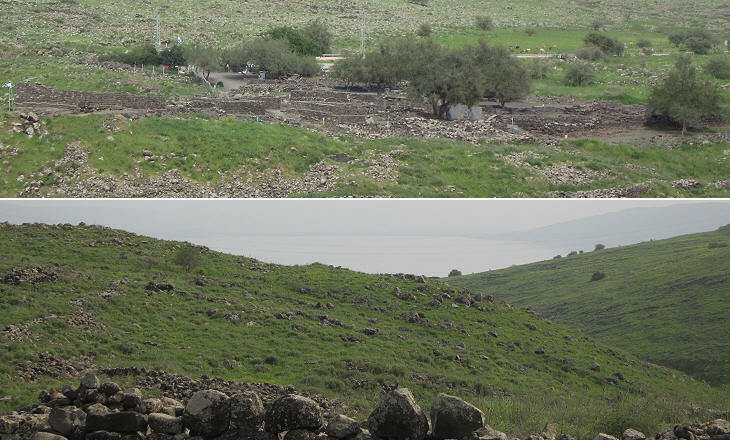 By looking at the (very small) central area of ancient Korazim it is difficult to imagine that the farmers and fishermen of this village lived such dissolute lives to deserve such harsh words. As a matter of fact archaeologists have not found evidence that the site was inhabited at Jesus' time. The Babylonian Talmud (compiled in the IIIrd/Vth centuries AD) mentions Korazim for the good wheat grown there. 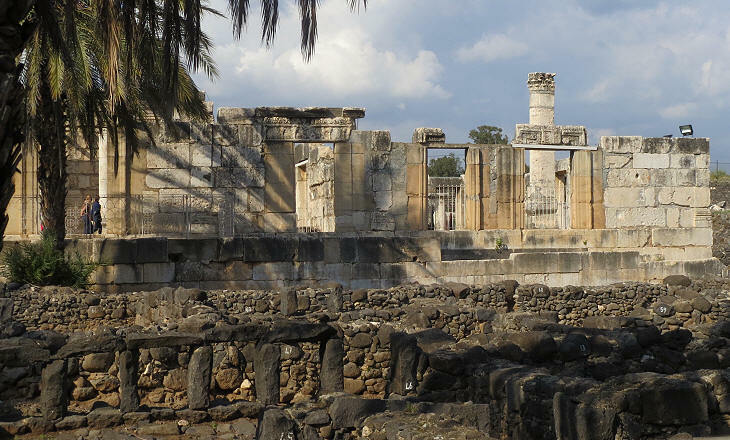 The settlement was probably founded by farmers in the early IInd century AD when the whole region between the Sea of Galilee and Damascus became a granary of the Roman Empire (see a section on Hauran, the Syrian region north-east of the Sea of Galilee). The synagogue of Korazim was built in the IIIrd century, damaged in the following one and restored in the VIth century. 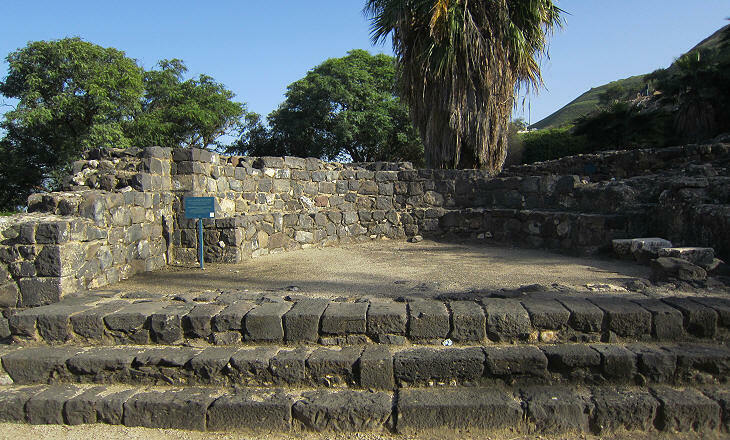 There are conflicting views on whether the building had an upper storey for women; archaeological evidence suggests that there was no separation between men and women in this and other ancient synagogues. The architectural design of the synagogue follows the pattern of similar non-Jewish buildings of the region. 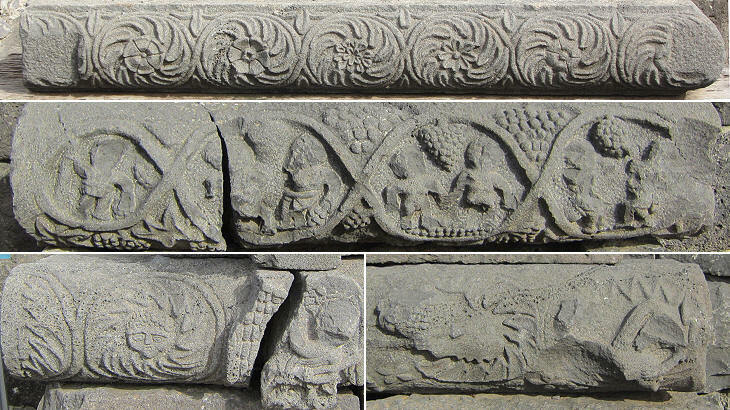 Its elements were finely decorated by skilled sculptors, as basalt, the hard black volcanic rock used for them, is difficult to work; it has however the advantage of not easily deteriorating over time (you may wish to see other fine basalt reliefs at Shaqqa, a town of farmers in Syria). In 1894 the Franciscans bought a piece of land on the northern shore of the Sea of Galilee (a few miles south of Korazim) in the assumed site of ancient Capernaum. 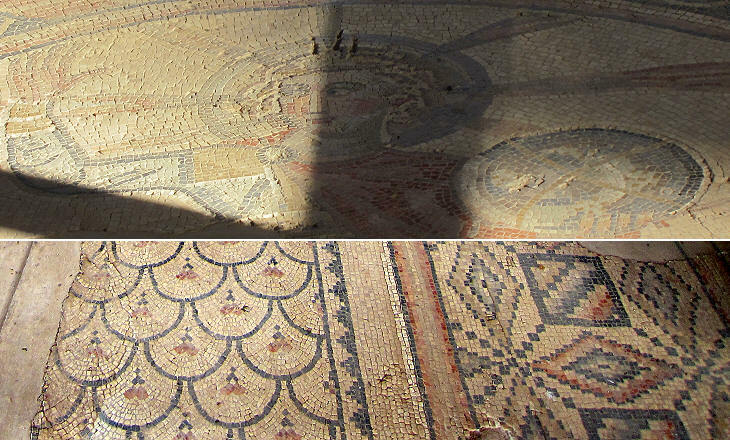 They started excavations meant to find the house of St. Peter the Apostle; they did find some scanty evidence of a Byzantine shrine, but the main achievement of their work was the unearthing of a very fine synagogue. 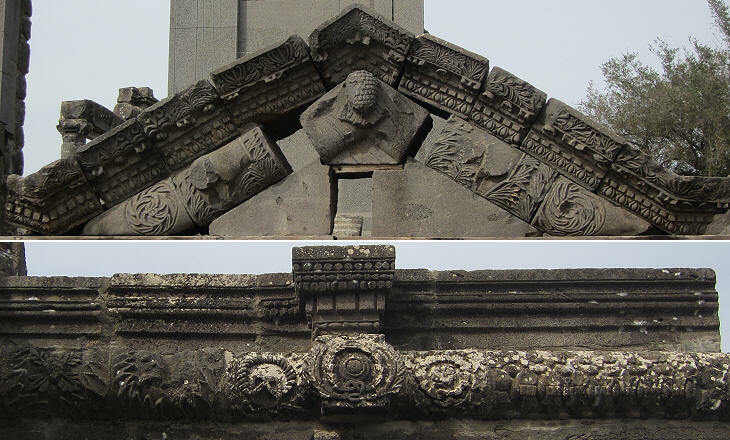 The building is dated IVth century and it has the shape of a Roman basilica with columns dividing the main hall into three naves, each of which had its own entrance. Stairs leading to an upper floor are seen as evidence of a matroneum, a gallery where women attended ceremonies, but it could simply have been a way to increase the attendance. 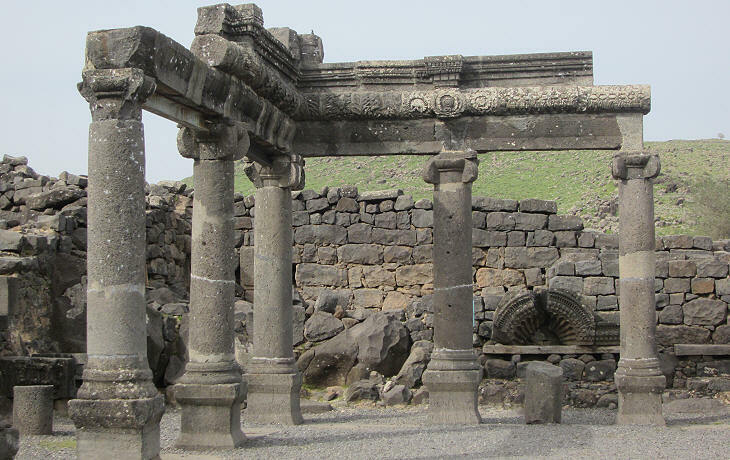 While most of the dwellings of the small town unearthed near the synagogue were built with local basalt stone, white limestone was used for the synagogue. In addition to traditional columns combinations of two columns or of a column and a pillar were used. A similar architectural development can be seen in other buildings of Galilee or in Byzantine churches as at Philippi in Greece. 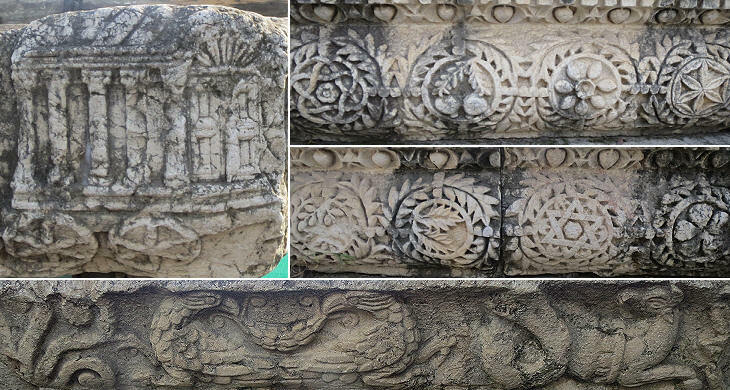 The decoration of the building shows a high level of workmanship and an impressive variety of motifs, very often of a geometric type, but occasionally depicting Jewish (palms, Torah shrines) as well as Roman (eagles, wreaths) symbols. 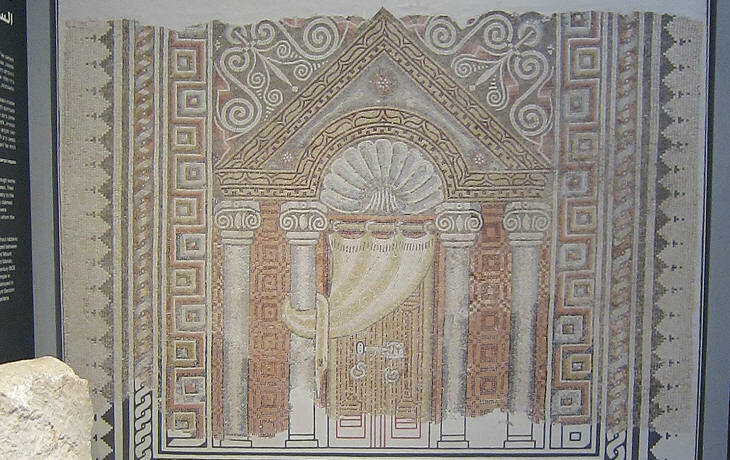 A similar attempt to combine classic patterns with Jewish symbols can be seen at the synagogue of Ostia, the ancient port of Rome. Tiberias was one of the richest towns of Galilee and this was partly due to its hot springs which have been exploited from King Solomon's time to the present one (you may wish to see the small Ottoman hammam and learn why Mark Twain did not wish to see the site). 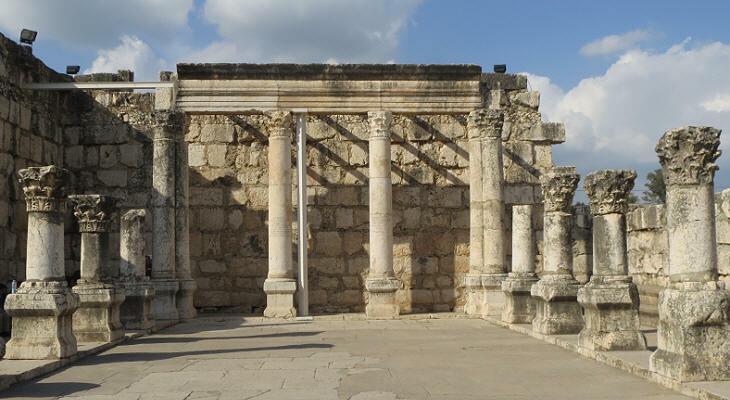 In circa 230 AD a synagogue was built at a short distance from a small Roman bath establishment. This synagogue was replaced by a second one at the end of that century and eventually by a third, larger one in the Vth century. It is possible that earthquakes caused the collapse of the first two synagogues. 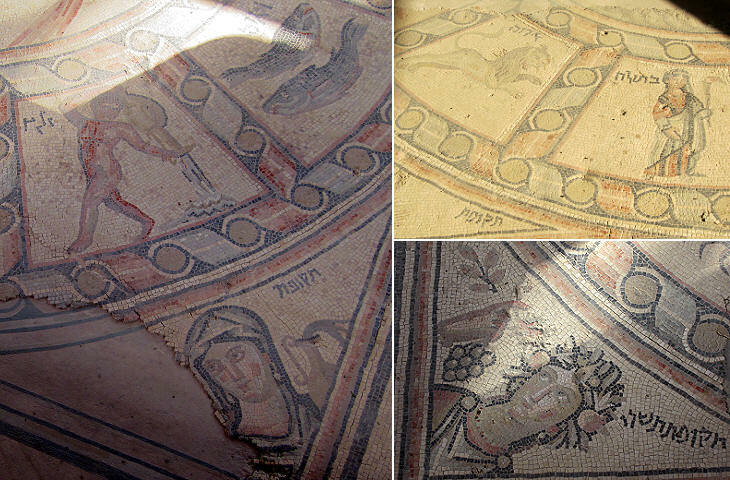 Archaeologists were stunned by the mosaic they unearthed under the floor of the third synagogue. It covers the entire hall of the second synagogue and it is almost intact. The donors had their names placed near the entrance between two lions and one cannot avoid thinking about how many temples, palaces, gates and eventually churches had guardian lions watching their entrances. The centre of the hall was decorated with a "Four Seasons" mosaic, a very popular subject which can be found in many provinces of the Roman Empire, especially those where farming had a particular importance as in today's Tunisia (you may wish to see mosaics of the Four Seasons at the Museum of Bardo or at that of Thysdrus); the signs of the Zodiac were a logical complement to the portrayal of the Seasons. The Seasons and the Zodiac signs framed a central medallion portraying the Sun riding a (lost) chariot and holding a globe, symbol of power. 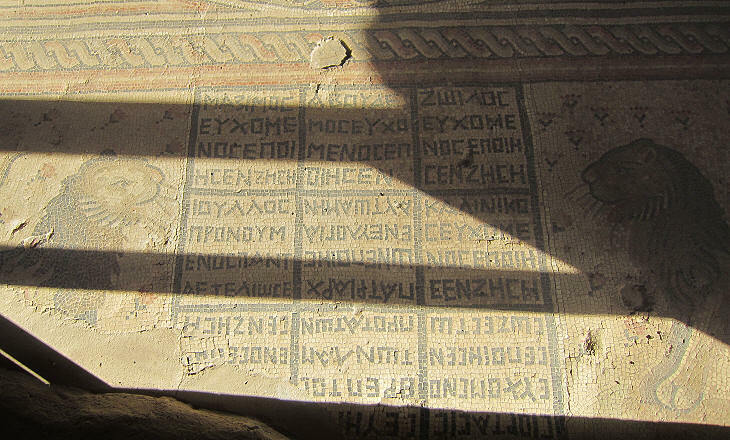 This mosaic was most likely the first of three similar mosaics found in synagogues in Galilee (you can see the other two in the next page). Today these mosaics divide the Israeli society; some appreciate the work of art and regard the prohibition to portray human beings as something linked to a period when idolatry prevailed. Others see them as evidence of abominable Jewish assimilation into the pagan culture and they would destroy them if they could. The main hall is flanked by an aisle decorated with less divisive geometric patterns. The mosaic at the end of the main hall is similar to that at the beginning of this page and is entirely in line with the nature of the building it decorates. 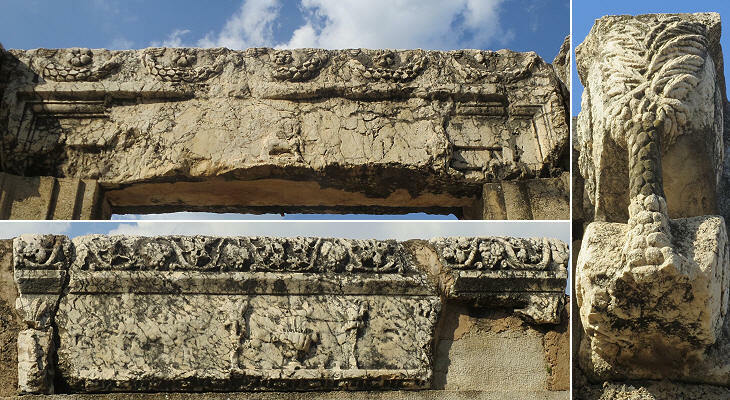 The image used as background for this page shows a relief at the synagogue of Capernaum.